This morning at New York City's Grand Central Vanderbuilt Hall, Bank of America held an event to promote its new debit card product, "Keep the Change," which rounds up purchases to the nearest dollar and places it in a saving account for the card holder. 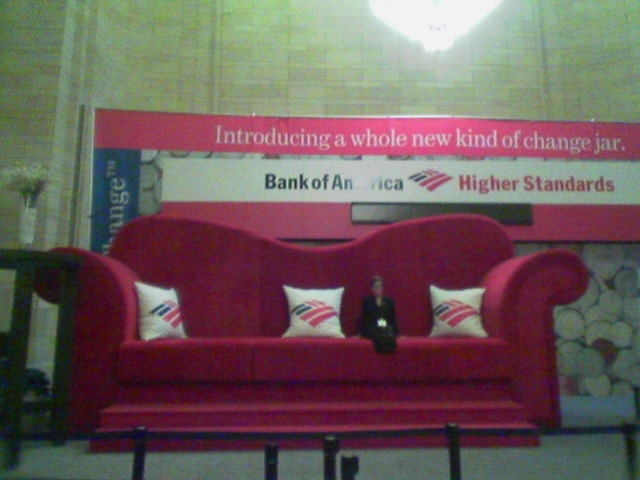 To attract attention to the new card, a gigantic, 20 foot long, 10 foot high sofa was placed in the Hall where people could climb on and reach beneath the cushions to find prizes such as MetroCards, Starbucks cards, restaurant gift certificates, retailer gift certificates and Apple store discounts. This promotion, created by Jack Morton, aligns quite well with the whole money-stuck-under-the-couch-cushion thing. More photos to follow. Yesterday, Commercial Alert's Gary Ruskin said his organization sent a letter to the FTC asking it to investigate buzz marketers, whom he claims "are perpetrating large-scale deception upon consumers by deploying buzz marketers who fail to disclose that they have been enlisted to promote products. This failure to disclose is fundamentally fraudulent and misleading." He specifically named P&G's 250,000-strong Tremor, a group made up of teenagers who talk up products to their friends. As pointed out by Word of Mouth Marketing Association President Andy Sernovitz, Ruskin incorrectly lumps together buzz marketing with guerrilla and stealth marketing. Following the Commercial Alert release, WOMMA quickly responded with a clarification of the difference between buzz, stealth, guerilla and word of mouth methods and procided a statement of its position on word of mouth and buzz marketing which, in a nutshell, requires open, honest and full disclosure in all marketing efforts. To promote the first Italian edition of Robert McCammon's book, "They Thirst," a coffin full of books was carried through the streets of downtown Rome. 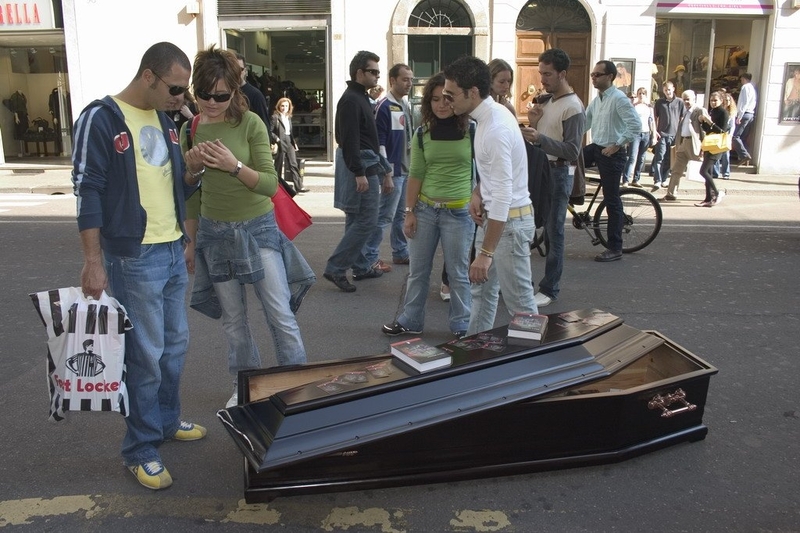 A street team, which carried the coffin on their shoulders, offered everyone a coupon of sorts for a free coffin in case they found themselves facing death by vampire. The stunt was created by guerrigliamarketing.it for Gargoyle Books and induced smiles, curiosity and various odd religious rituals among onlookers. See more images of the promotion here. Armed with cameras, tape measures and smirks for those who don't measure up, images of models above urinals in the New Zealand Sofitel Queenstown Hotel have made the bathroom going experience a bit more enjoyable...or less enjoyable for those standing in front of the wrong stall. Choose wisely lest your stall mates will have cause to question your manhood. On Tuesday, Luanne Calvert of Mixed Marketing did her thing again. After bringing a Time's Square billboard to life for the relaunch of CK One, creating a human snow globe for Yahoo! Shopping, and putting on Netflix's Movie Watching Marathon event, Calvert hosted the "world's largest picnic" in San Francisco to celebrate Oakville Grocery's San Francisco store opening. The picnic was open to the public and featured free picnic basket lunches for the first 500 guests. The picnic took place on a red and white blanket that was nearly 10,000 feet square in size. See some images of the event here. UPDATE: In Comments, Guillaume points out the French have the Americans beat by five years with sparkling water company Badoit having done the picnic thing. Also, the "billboard brought to life" thing was done long ago as well by Chantal Thomas. Apparently, there is a world outside of America. 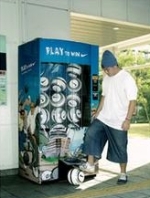 Nike has placed several vending machines in Singapore, reports Adverblog, which dispense Footballs (soccer balls for those of us in the U.S.) as a means to promote the sport thereby increasing the need for people to buy football shoes, clothing and equipment - ideally from Nike. TV Squad sums up some of the recent non-traditional marketing promotions the networks have engaged in to insure their new shows are seen. NBC is promoting Three Wishes with street teams that perform random acts of kindness by buying stuff for people with dollar bills affixed with promotional stickers. The WB is giving Supernatural a boost with coffee sleeves that project project images on the walls and ceiling. And FOX is promoting Reunion (good show, by the way) with a sweepstakes with a reunion vacation as the prize. 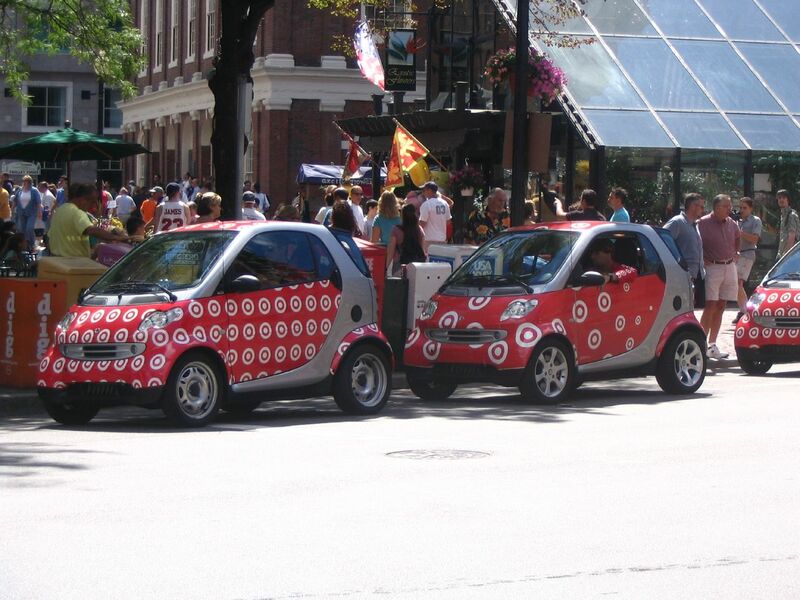 Those little Target-branded cars have been making their rounds. This past weekend they were spotted at Boston's Quincy Market. The tiny, little cars are emblazoned with the "target" and roam the country in search of ogling consumers. 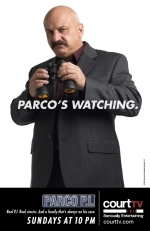 Accompanying the recently launched online game for the upcoming Court TV show Parco's Watching, San Francisco-based Venables Bell has created additional campaign elements including posting on ATM machines, in laundromats, on bathroom mirrors and on bar coasters along with taxi tops, bus posters and wild postings. The phone kiosks have slogans that say "Because Vinnie Parco was watching, I went from successfully cheating on my wife to living with my mom." The bar coasters say things like "Would you want this conversation you are having to be overheard?" The work can be viewed here. While we seem to think we have seen this stunt before, it's still a very attention getting advertising tactic. To promote HBO's Sopranos, BBDO, we're told, placed life-like arms hanging out of a few cabs. New or old, we still think it's a great piece of advertising.